While at LifeAT50+ in Boston Mary Ann and I stood in front of a green screen for a photo and then was handed this photo. It was kink of interesting, but what is “THE BOOMER LIST”. Several of our friends were asking about THE BOOMER LIST also so I contacted Jen Reeves with AARP and received a press release about THE BOOMER LIST which explains everything. WASHINGTON, March 31, 2014 /PRNewswire-USNewswire/ — 2014 marks an important shift in American culture, as the last of the baby boom generation will turn age 50 by the year’s end. To mark this momentous occasion, AARP today announced it is partnering with renowned American documentary filmmaker and photographer Timothy Greenfield-Sanders to present The Boomer List, a comprehensive look at 19 iconic boomers—one born each year of the baby boom from 1946-1964. 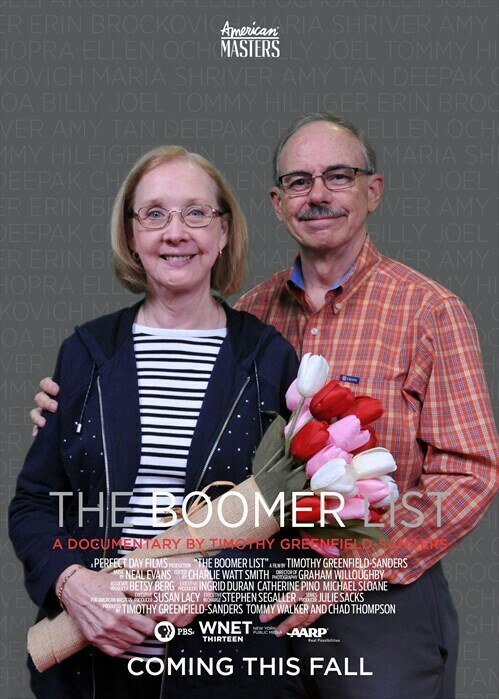 The Boomer List will come to life later this year as an American Masters documentary film on PBS, a companion book, and an exhibit at Washington, D.C.’s Newseum, a museum that blends news history with up-to-the-second technology and is one of the city’s top attractions. OK so it’s a documentary movie, thus the movie poster overlay on our photo above. What a great way to advertise a movie – give people a movie poster with them in it, to share with the world like I am doing here. Wow, very cleaver. Good move AARP! The Boomer List documentary will highlight notable figures including music legend Billy Joel and novelist Amy Tan, author of “The Joy Luck Club,” and will debut in fall 2014 on PBS’s award-winning American Masters series. Viewers will gain insight into the Boomer generation through intimate interviews and portraits by Greenfield-Sanders that focus on exceptional achievement, struggle and identity, telling the story of extraordinary Americans and the history they lived through and often created. Film subjects will illuminate the important movements and changes that shaped the world during the baby boom years. Topics will include the environment; arts and entertainment; science; civil, LGBT and women’s rights; law; politics; public service; sports; the military and technology. Well this could be interesting, but celebrities are not the only ones who lived through what we lived through. I guess they couldn’t interview each one of us Boomers could they. That would take a long time. Additionally, the 19 large-scale boomer portraits will be part of a nine-month exhibition at the Newseum in Washington, D.C., highlighting newsworthy people from the baby boom generation. “The Boomer List: Photographs by Timothy Greenfield-Sanders” opens Sept. 26, 2014, and will be on display through June 2015. Throughout the exhibit’s run, the Newseum will host a series of special programs and events that explore how boomers changed the world and the legacy they leave for future generations. I wonder it their portraits will also have the movie poster overlay? The Boomer List is the latest initiative announced as part of AARP’s yearlong program, Boomers@50+, which is sponsored by Consumer Cellular and celebrates this influential generation. This multi-platform initiative provides opportunities to reflect on how boomers have changed the world and to ask the question, “What’s next?” AARP will highlight The Boomer List as a central element of the celebration. To find out more about the baby boom generation and the events that shaped boomers’ lives, visit www.aarp.org/boomers.